With the CU-VD50 SHARE STATION®, playback of created AVCHD DVDs is also possible. You can enjoy powerful Full HD video on HDTV. No PC required. * Footage recorded in the UXP mode cannot be stored to disc using the CU-VD50/VD3. Use the supplied MediaBrowser software installed on your PC to store footage onto Blu-ray disc or hard disk drive. For other suggested archiving solutions, please refer to the Optional Accessories page. Direct connection with Everio via USB2.0. 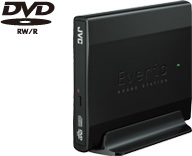 DVD burning operation can be controlled by Everio. Uses DVD-R/-RW disc, DVD-R DL disc supported. Can be used horizontally or vertically (Stand included). We recommend using a JVC DVD Disc. BN-VF808 can also be used. Everio includes patented and other proprietary technology and is made to be used with the JVC Data Battery and not with other batteries. JVC cannot guarantee safety or performance of the camcorder when it is operated by other batteries. For additional information about JVC Data Battery, please contact an authorized JVC dealer in your country. Just connect with Everio via USB*. Recorded data can be stored and played back with easy operation via connected Everio. *Optional USB cable required (Mini A male to A female). Creates Blu-ray discs without a PC! Not all accessories available in every region. Please check with your dealer. Copyright © 2009, Victor Company of Japan, Limited (JVC). All Rights Reserved.